Music in anime. As anyone who has ever tried to describe music, it just “really helps set the mood/the tone/the atmosphere/the feeling (or whatever grossly vague word of choice).” With music so strongly linked to anime, what with character songs, OP/ED songs, and insert songs, it’s inevitable that we get set scenes in which music gets performed, in real time, within the reality of the anime itself. These concert scenes take up a defined amount of time and attention, and interestingly enough they’re typically the culmination of some effort or struggle on the part of the main characters. Sure, you could mark these scenes down as cheap ploys to market CD’s. Hell, you could probably say that about every single idol series, and it wouldn’t be completely wrong. But as we’ll see throughout the list, these concert scenes can act as plot devices that pull characters together, having them work in concert. Disclaimer: I’ve only pulled selections from series I’ve watched before. I also apologize for the bad quality in many of these videos, but with music copyright being such a huge issue, I guess it can’t be helped. This being a list about concert scenes, it seems only appropriate to start this list off with a series dedicated to the art of concerts. I chose this because I think it’s an iconic moment in the series and defines Nodame’s character. I also can’t get enough of the badger/weasel thing. Here, we have a melding of tradition and innovation, with the Japanese style dress, Gershwin, and Nodame’s ridiculous melodica. In a discipline that treasures tradition above anything else, a little bit of thinking outside of the box goes a long way in terms of creating something truly remarkable. I mean, that’s what Gershwin did with “Rhapsody in Blue,” right? Hinagiku’s birthday arc is the best series of episodes in all of Hayate no Gotoku!, and it ranks pretty high with me in terms of awesome arcs in anime, in general. 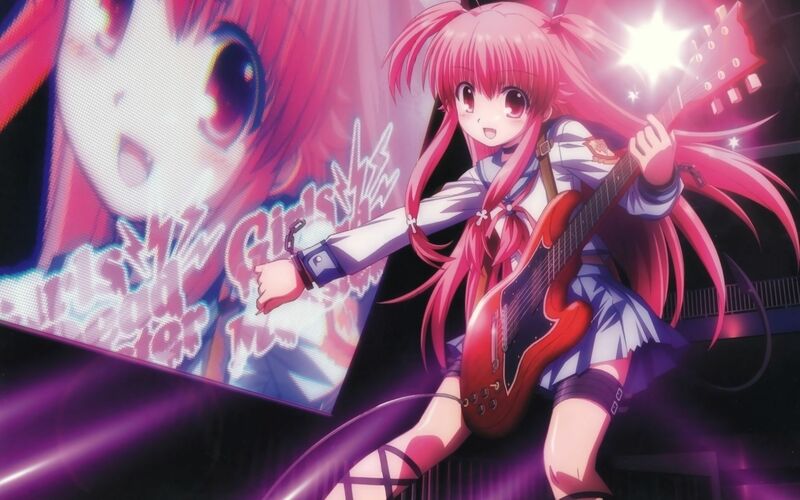 Hinagiku is such a great character, being one of the original likable tsunderes, and this concert scene contributes a lot to why I like her so much. Hayate no Gotoku! loves to parody other anime series, and it does it big here with Hinagiku’s cover of Evangelion’s OP song. Something originally so serious is now being sung as karaoke, while our intrepid hero is running through the school grounds dressed as a bunny maid. Classic. Too bad we don’t get to hear the rest of the Student Council sing the theme from The Girl Leapt Through Time. If there was ever a metaphor for homoeroticism a strong brotherly connection, an improvisational jazz duet would be one. The ability to work with each other, on the fly, to produce music that warmly melts together is incredibly difficult. An intimate knowledge of each other’s habits and styles is a must. This performance by Kaoru and Sentarou is proof of how close they’ve become with each other, as they whiz through different styles to create a medley of three songs featured earlier in the series. These songs include “My Favorite Things,” “Someday My Prince Will Come,” and “Moanin’,” all of which have thematic significance to the narrative. This just might be the most famous concert scene on this list. In a series, no, in a world in which Haruhi gets to do anything she wants to, starring in a school concert (while wearing a bunny girl outfit) isn’t too surprising. What may have been a little surprising is just how good the songs that are performed actually are and how this scene has gone down in anime history. We must also not forget to mention Kyoto Animation’s great job with animating the performers’ movements. This is a trend that we’ll be seeing more of down the list. I conceived the idea for this list a long while ago, and I think it actually first came to me when I saw this scene. If I had to choose a concert from this series, any of Kanon’s performances would be a natural choice, but instead this particular scene grabbed me. Watching that moment when time slows and the goddesses reveal their wings made my breath stop. The lyrics of the song are meant for Chihiro, but I think a lot of it applies to Keima as well. It’s a surprisingly heartfelt way to end a series (or at least season) that never really takes itself seriously at all. Unfortunately, I couldn’t find a video of the actual concert scene, so we’ll have to make do with this edited version. It’s a shame because part of the enjoyment came from watching how the simultaneous events played out while the concert was happening. For something that came out 4 years ago, this particular scene still looks fantastic. I also love when they show Yui in the crowd because it really builds up how important Girls Dead Monster is for everyone in this world. It also makes Yui’s induction into the band that much more meaningful. I could’ve chosen a lot of different songs from K-On!, but this one always seems to stick out to me, even over the holy “Fuwa Fuwa Time.” I like the presentation of “U&I” a lot more in the movie version, but it lacks the meaning that it has in the main series. Yui puts this song together for Ui, as a thank you for everything she’s done for her. If you’ve ever watched the series, then you’ll know that Yui is pretty hopeless all the time, and Ui genuinely worries about whether she’ll be okay in the future. For me, a lot of K-On! is Yui finding a place where she belongs, and this song that she writes by herself is proof that she’s found her own way. I’ll be honest, I wasn’t too into any of the Love Live songs that were performed throughout the series. That all changed when I heard “Snow Halation,” from episode 6 of the second season. It’s a song that has beauty, power, and heart. I think Love Live’s greatest strength lies in its detailed and high-quality animations of the characters’ movements and expressions. It’s a shame that it’s not done all the time, but I think I’m starting to warm up to the CG a bit more. This particular video gives a comparison shot of the original PV version (upper left) and anime version (bottom right), and it’s cool to see what was kept true and what was improved. This scene came dangerously close to grabbing the top spot, just for its sheer awesomeness. I wrote about my initial impressions about the episode way back when, and to summarize: it’s one of the most amazing things I’ve ever seen in my life. The composition of the episode’s events, the character’s comedic interactions, topped off with this spectacular scene, create something truly remarkable. I’m sure most of you think I’m spouting nonsense. You all may be right. But let’s all agree on one thing, KyoAni animating an idol series would be a fantastic sight to behold. I’ve watched this scene an embarrassing amount of times, and I still don’t know why they’re wearing birthday hats in the flashback. Robbing this scene of its first place spot would be a dire act of poor judgment. It’s THE most powerful moment in the entire series, and one of the most powerful in any of the anime series that I’ve ever watched. None of this would be possible without the great voice of Chihaya’s (CV: Asami Imai). After losing her voice, it returns in the biggest way possible. Her singing makes the scene and seeing her younger self run out from behind her is cinematic brilliance if I’ve ever seen it. 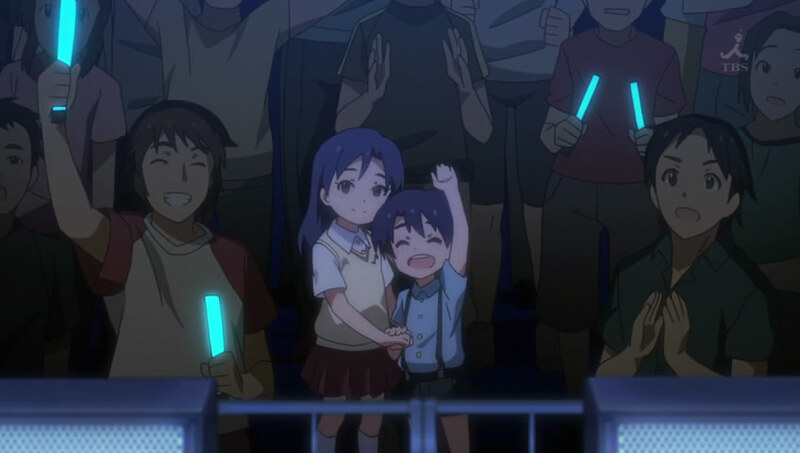 If you haven’t watched The iDOLM@STER, and you like music in anime, then do yourself a favor and watch it! I hope you’ve enjoyed the list! Let me know which concert scene is your favorite (especially if you think I’ve missed a good one)!